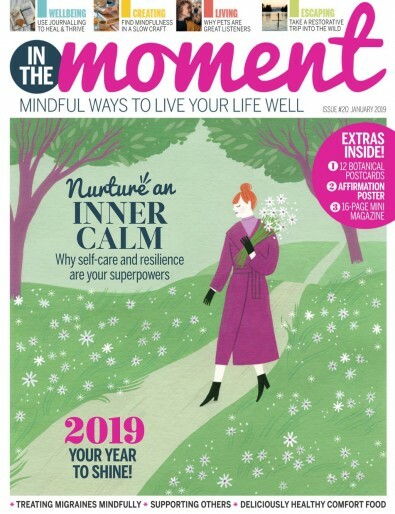 Click on image to the left to see this article which appears in 'In the Moment' Magazine, January 2019. Anxious thoughts can tend to hook themselves onto us like sticky burrs, taking up valuable mental resources and headspace, often with the ‘snowball’ effect of gaining in size and momentum the longer we allow them to hang around in the hope that they will just ‘go away’. Human instinct often tells us to side-step facing our difficult thoughts and feelings head-on, and it’s all too easy to then become highly adept at avoidance tactics, even developing other annoying – but distracting rituals such as OCD behaviours, retail therapy or disordered eating patterns in preference to confronting problems head-on, and eventually learning that it is possible to find ways through them. Counsellor and writing for wellbeing practitioner Jo Bisseker Barr encourages her clients to write their thoughts and feelings down, including their worries, as a way of capturing them in black and white. Many report back that the process of taking up a pen and writing down what they are feeling causes them to slow down a little, which steadies breathing, makes thinking a bit clearer, and often opens up a bit of space for reflection – which can lead to new kinds of connections, more positive thinking, and improved mood. 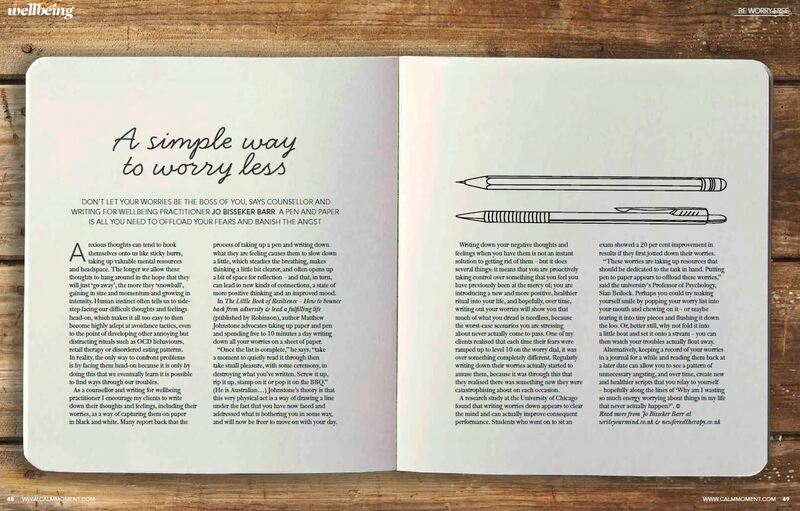 In ‘The Little Book of Resilience – How to bounce back from adversity and lead a fulfilling life’ (Robinson, 2015), author Matthew Johnstone advocates taking up paper and pen and spending 5 – 10 minutes a day writing down all your worries on a sheet of paper. ‘Once the list is complete’, he says, ‘take a moment to quietly read it through then take small pleasure with some ceremony in destroying what you’ve written. Screw it up, rip it up, stamp on it or pop it on the BBQ’ (he’s Australian…..). Johnstone’s theory is that this very physical act is a way of drawing a line under the fact that you have now faced and addressed what is bothering you in some way, and will be freer to move on with your day. Writing down your negative thoughts and feelings is not an instant solution to getting rid of them – but it does several things: it means that you are proactively taking control over something that you feel you have been at the mercy of; you are introducing a positive, new and healthier ritual into your life, and hopefully, over time, it will show you that many of your worries are pointless, because the worst-case scenarios you are stressing about never actually come to pass. One of Jo’s clients realised that each time their fears were ramped up to level 10 on the worry dial, it was over something completely different! The regular writing down of their worries actually then amused them, through realising there was something new that they were catastrophising about on each occasion. A research study at the University of Chicago found that writing worries down appears to clear the mind and can improve consequent performance. Students who went on to sit an exam showed a 20 per cent improvement in results if they first jotted their worries down. Perhaps you could try making yourself smile by popping your worry-list into your mouth and chewing on it – or maybe flushing it down the loo. Or fold it into a little boat and set it onto a stream - you can then literally watch your troubles float away. Alternatively – keeping a record of your worries in a journal and reading them back at a later date will hopefully allow you to see a pattern of unnecessary angsting, and over time, create new and healthier scripts that you relay to yourself: something like - Why am I wasting so much energy worrying about things in my life that never actually happen?